Some quick doodles for a new chapter of Wrangling F1 Data With R, looking at the state of the drivers' championship race as we go in to round 17. Now we can have a look at the data. 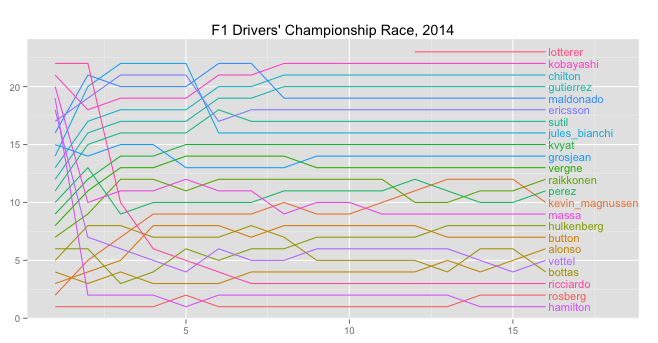 First, the race in the style of a lapchart, plotting the position standings after each round. 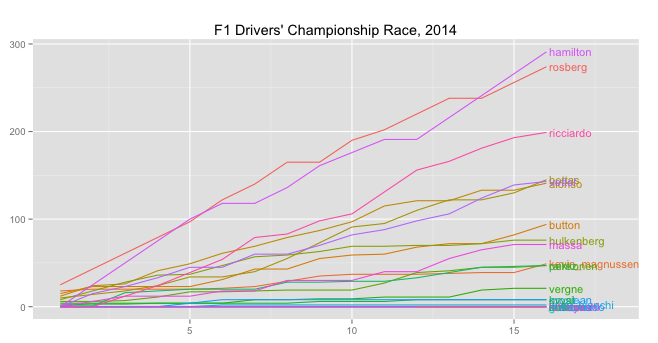 This chart shows competition throughout the season particularly between the first two places (Rosberg and Hamilton), fourth to sixth (Bottas, Vettel and Alonso), and ten, eleventh and twelfth (Magnussen, Perez and Raikkonen). 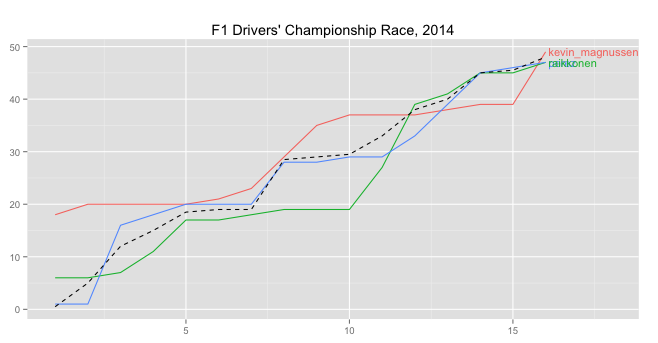 We can get a better feel for the competition in terms of the number of points separating the drivers. Here we see how close fought the fourth to sixth battle has become, as the the points battle for tenth place. We also see a late season charge from Massa, who could still challenge Hulkenberg for eighth. Let's annotate the chart a little more by placing a guideline showing between 10th and 11th positions. Once again, we really need to tweak the label positions manually so that they are note overlapping if we want to use this chart as a presentation graphic. Elements of this recipe may form part of a forthcoming chapter in the Wrangling F1 Data With R book.